Omega-3 Eggs for Paleo and Keto: Healthy or Hype? 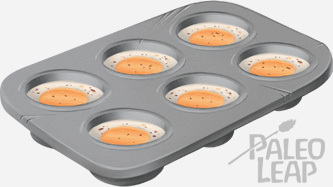 Omega-3 eggs are exactly what they say on the tin: eggs with extra Omega-3 fats in them. The best “natural” dietary source of Omega-3 fats is fish – fatty fish like salmon, mackerel, and sardines provide tons of Omega-3s. But not everyone likes fish (and some people are allergic) – and just generally, there’s a lot to be said for having than one dietary source of any particular nutrient, especially when it’s something so important. Enter Omega-3 eggs. Omega-3 eggs: where do they come from? Omega-3 eggs are made just like normal eggs: they come from chickens in the ordinary way and they aren’t tampered with or enhanced after the fact. The Omega-3s in the eggs come from the food that the chicken eats. Usually, the chickens are given extra flax seed, a plant source of Omega-3 fats. Other times, they get fish oil or algae, both natural marine sources of Omega-3s. Chickens may also be given extra antioxidants to protect all those Omega-3 fats they’re eating and then passing on to you. In a fun case of “nutrients affecting each other,” adding antioxidant-rich marigold powder apparently also boosts Omega-3 content. Just like the fat content of a mother’s diet is reflected in her breast milk, the fat composition of a chicken’s diet is reflected in its eggs: lots of flax or algae means lots of Omega-3s in the yolk. Think of it as the chicken eating fish oil so you don’t have to. And it can dramatically increase the Omega-3 content of the finished product. According to this study, 3 regular eggs contain about 277 mg of Omega-3 fat, while 3 Omega-3 eggs contain about 777 mg, almost three times as much. Another way to put it, according to a different study, is that eating 3 Omega-3 eggs give you about the same amount of Omega-3 fat as you’d get from a meal with fish. Research on Omega-3 eggs: healthy or hype? This study found that, in healthy people, eating Omega-3 eggs reduced blood pressure, improved blood lipids (the reduction in triglycerides was particularly notable), and calmed inflammation. In another study, researchers confirmed that Omega-3 eggs reduced triglycerides and systolic blood pressure (that’s the top number of the two in your blood pressure readings). 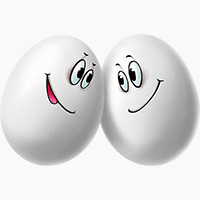 And another study confirmed that eating one Omega-3 egg per day had positive cardiovascular effects. For nursing moms, eating Omega-3 eggs also increases the Omega-3 content of breast milk – with corresponding benefits for the baby. Most of these are pretty small studies, but they do offer at least a little bit of reassurance that money spent on Omega-3 eggs isn’t completely going down the drain. The most obvious drawback of Omega-3 eggs to anyone who walks into a grocery store: they’re significantly more expensive. The higher cost of feeding the chickens all that flax and seafood translates into a higher cost for the eggs – unfortunately, that might put Omega-3 eggs out of financial reach for some folks. Due to the same Omega-3s that make them nutritious, they may also be more vulnerable to oxidation. Oxidation is damage to the fats that basically counteracts all their healthful properties. But don’t stress – the study linked above suggests that you’ll know immediately if the Omega-3s in your eggs are oxidized. Eggs with oxidized Omega-3s will have a fishy “off” smell that is easily detectable and pretty unpleasant. Even though the chickens do eat some seafood, Omega-3 eggs shouldn’t smell like fish, especially not like fish gone a little off. If it smells like a normal egg and tastes like a normal egg, you’re fine. Omega-3 eggs aren’t “natural” in that it’s not natural for hens to eat tons of algae and flax seed all the time. But it’s hard to find any evidence that this particular minor unnaturalness actually causes any demonstrable harm to the people who eat the eggs. For people who can’t or won’t eat enough fish, Omega-3 eggs might be a useful way to get some good Omega-3s into the daily routine without having to remember to take a supplement (or put up with the taste of cod liver oil, which is objectively disgusting). Plus, because the hens usually get more antioxidants as well as Omega-3s in their diet, the egg yolks of Omega-3 eggs may turn out darker yellow and more flavorful – and more antioxidant-rich. 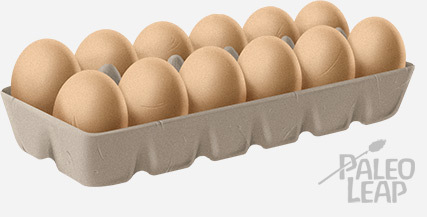 So in that sense, Omega-3 eggs give you some of the antioxidant benefits of real pastured eggs. They’re definitely a dietary nice-to-have, and probably not as good as real farm eggs, but if you’re struggling with inflammation issues or high triglycerides, the evidence suggests that Omega-3 eggs may be a helpful addition to a Paleo or keto diet. Do you eat Omega-3 eggs? If so, why did you choose them – and if not, why not? Let us know on Facebook or Twitter!